Any seasoned exerciser knows the difference between a great workout and a bad one but what about when you’re just starting out? Whilst many newbie exercisers approach fitness with a "more is better" attitude, there's actually a lot more to a great workout than simply the amount you do. Not only can a great workout help sculpt you a killer bod, it can help relieve stress, boost energy and self-confidence and improve the quality of your sleep. While this isn’t scientifically proven and varies from person to person, if your stomach is rumbling following a workout and you’re craving carbohydrates, it’s a pretty good indication that you’ve depleted your body’s energy stores and now need to replenish them in order to begin muscle repair and recovery. Post-nutrition tip: To truly benefit from post-workout nutrition, try to consume a 2:1 ratio of fast absorbing carbs and protein within 30 minutes of a workout. This will kickstart the repair process allowing you to recover more quickly. Admittedly we’re not all in the gym to push our physical limits every single session, however, we all want to experience a sense of accomplishment and satisfaction that comes from a great workout. For many that comes from their rate of perceived exertion. The rate of perceived exertion (RPE) is a scale in which you can measure how tough your workouts are. Use whichever scale you like: 1-10, 1-100, 1-1000. The sweet spot, using the 1-10 RPE scale is typically between 6 – 9. A couple of things to think about when rating your workout: Could you hold a conversation? Did you work your muscles to exhaustion? How long was your workout? How tired did you feel towards the end of your workout? I’m talking about that oddly satisfying burning sensation building up in your quads pain, not the sharp stabbing sensation you’re experiencing in your lower back and knees pain. Needless to say the former is good, very good and signals muscle fatigue. This is a good indication that you’re pushing yourself and will reap the rewards of your tough workouts. The later is bad, very bad and is your body’s alarm bells ringing telling you that something isn’t right. With that in mind, it’s extremely important to learn how to distinguish between the 2 different sorts of pain and plan your workouts accordingly. If you ever feel a stabbing pain whilst performing an exercise, stop immediately and consult a personal trainer or specialist for advice. If you experience muscle burning, give your self a tap on the back - It's been a great workout! As counterintuitive as it seems, exercise should energise you, not make you feel sluggish and tired. Whilst many enjoy the feeling of exhaustion they experience towards the end of a killer workout (Myself included), you should walk away from a workout feeling energised and ready to take on the day. With practice and experience, you can find that perfect balance of workout intensity, frequency and duration. Note: If you feel exhausted in the hours and even days following a workout, it’s a good indication that you’re pushing yourself too hard and may have to reassess your fitness goals and workout plan. Sounder sleep is not only a good indicator of a great workout, it's a bonus! Not only should you sleep sounder at night, the stress relieving benefits associated with a great workout should help relax an overactive mind allowing you to nod of more quickly. Progress signals not only productive workouts but a solid training plan. Don’t feel that you have to take leaps and bounds every single session. However, do try to push for an extra rep, improve your 5k time by a few seconds or up your 1RP squat on a regular basis. Note: If you feel that your progress is slowing or perhaps even diminishing, it could be time to challenge yourself with a new training strategy. While many approach exercise with a more is better attitude, this is often not the case and definitely doesn’t signify a great workout. In your next workout, instead of focusing on quantity, think and focus on the quality of exercise. By paying closer attention to the technique you form a better understanding of your body and the exercises you’re performing. While you’ll likely be able to do more reps with bad form, these bad reps are not only counterproductive to the exercises you’re performing, they can be very dangerous and lead to injury! 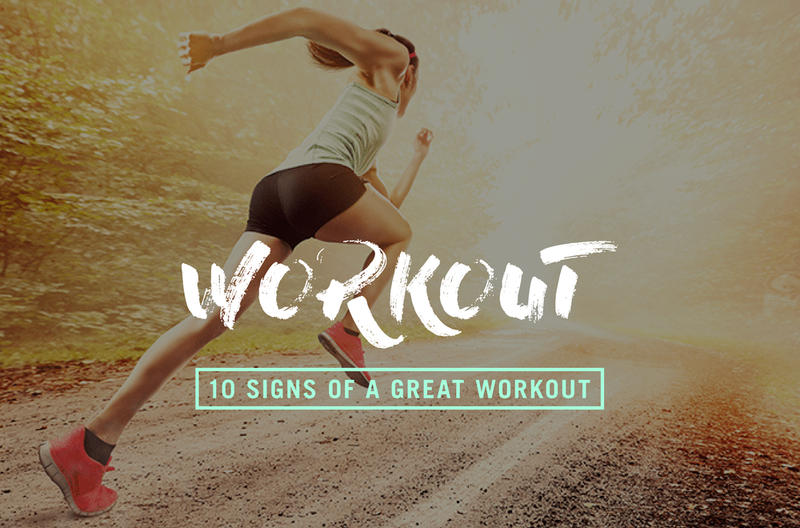 A sign of good form is the ability to concentrate on the muscles and body parts you're working during any given exercise. For example, when performing squats, focus on weight on your heels, a straight back and full range of motion. This will allow you to better use the muscles in question which yields more impressive overall results and satisfaction. Another example of quality over quantity is using interval training instead of your traditional moderate intensity cardio training. Whilst the later can be hugely beneficial to your fitness results it's not exactly time well spent when you can consider that high-intensity interval training delivers the same benefits in half the time. Sounds simple yet so many people get very little satisfaction from exercise. As apposed to slugging your way through a workout or activity that you hate, find something that you enjoy. This way you’re far more likely to stick at it in the long run. You don’t need to love every single second of every single exercise that you do, but a great workout is one you can say you enjoyed overall. If you enjoy working with numbers, tracking your heart rate during exercise can keep your mind focused whilst providing a more accurate measurement of your RPE. To calculate your maximum heart rate, take 220 and subtract your age. Something else to keep in mind is how quickly your heart rate returns to normal after a period of exercise. The fitter you are, the quicker it should return to its normal resting rate. If you experience an elevated heart rate in the hours following your workout, it could be an indication of overexercising. Exercise has been shown to decrease stress and improve mood by releasing endorphins – those beautiful little feel-good chemicals. If you walk into a workout in a stinker of a mood, take note of how you feel at the end. If you’re buzzing, count it as a win! A great workout doesn’t have to be all or nothing and certainly doesn’t have to hit every factor on the list above. Regardless of what your reasons for exercising are, a great workout should provide you with exactly what you need on that particular day. Older Post15 superfoods you should be eating!